Yves Saint Laurent Beaute Mon Paris Shower Oil, 6.6 oz. Yves Saint Laurent BeauteMon Paris Shower Oil, 6.6 oz. The new perfumed Mon Paris Shower Oil by Yves Saint Laurent. 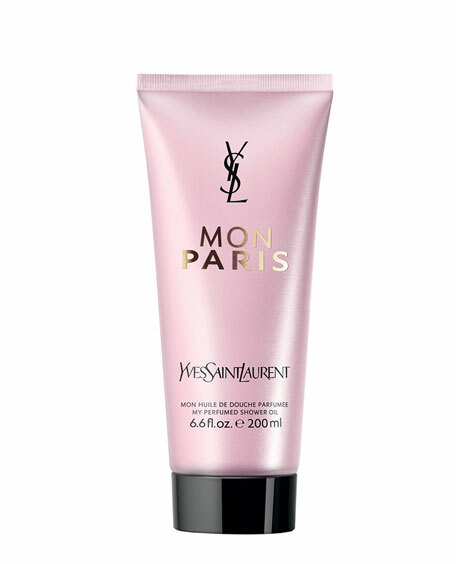 The rich, creamy foam gently cleanses the skin, leaving it delicately fragranced with the signature scent of Mon Paris. The sensuality of red berries and the exotic white Datura flower seduce the senses while the luxurious formula offers a generously foaming texture. 200 mL / 6.6 fl. oz. New YSL Forever Youth Liberator Water-In-Oil, a light replenishing facial oil that deeply nourishes and visibly restores skin's healthy appearance. New YSL Forever Youth Liberator Water-In-Oil, a light replenishing facial oil that deeply nourishes and visibly restores skin's healthy appearance. The non-heavy water-like feel leaves skin smooth and radiant. Suitable for all skin types. 30 mL/ 1.0 fl. oz.